It is imperative that all Christians around the world pray for Muslims during the month of Ramadan and throughout the whole year. We would like to urge you to not only get involved in this critical prayer opportunity yourself, but to enlist your praying friends, your prayer group, and your church! 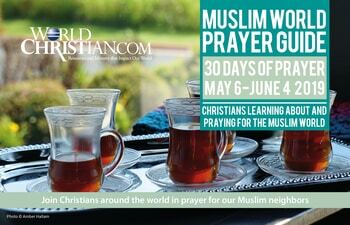 Each year many millions of Christians around the world join in prayer for the Muslim World during Ramadan. This is a strategic time for the body of Christ to pray for the Muslim people of the world. Only God knows the answers to our prayers as we have joined together around a common theme. A great joy has been to see not just individuals and families pray together, but also prayer groups and churches. Let us believe God for mighty things as we join together to focus on Him during this annual prayer time – and throughout the year – for the Muslim world. In 2019 Ramadan will be from from 6 May to 4 June. 30 Days Muslim Prayer Guide booklets may be ordered online for PDF downloads. In the USA you can order prayer guide booklets both for adults and children from WorldChristian.com, 30 Days Muslim Prayer Guide Box 9208, Colorado Springs, CO 80932, USA, Tel: 1-719-442-6409, 1-888-926-6397, Fax: 1-719-227-0478, web site: http://www.worldchristian.com/. See “Global Prayer Guide Directory” for a list of locations in other countries from which materials can be ordered. See also the Press Release and the list of resources at http://www.30daysprayer.com/resources.php. May God bless you richly as you join Him in bringing the Good News to the ends of the earth! At this juncture of world history it is even more critical, if we can consider that possible, than ever before that we join with millions of Christians around the world to pray for Muslims during the month of Ramadan, which starts 6 May 2019. Ramadan is the month during which Muslims observe a strict fast from dawn till dusk each day. Ramadan is a strategic time for the body of Christ to pray for Muslims to come to a saving knowledge of Jesus Christ. The great majority of the over 1.6 billion Muslim people of the world at present have no chance, humanly speaking, of ever even meeting someone who can tell them that Jesus loves them. In fact all too often the Muslim population of the world is viewed as the enemy of Christianity, instead of persons for whom Jesus died. But that picture can be changed. And prayer is the place we must start. Pray that the Lord of the Harvest will send out workers. Pray that Muslims will be open to the Gospel. Pray that the strongholds of the Enemy will be broken down in lands and hearts dominated by Islam. In previous years tens of millions of Christians were estimated to have prayed for Muslims during Ramadan. Only God knows all of the wonderful answers to those prayers. You are invited to join in great joy with individuals, families, prayer groups, and churches praying together this year for Muslims around the world. Prayer guides for this 30 Days Muslim Prayer Focus will be available for you at a table outside the church on the Sundays 28 April and 5 May. Please take one of these guides and use it to help you pray that Muslims throughout the world will turn to Jesus, the Light of the World. Let us believe God for mighty things as we join together to focus on Him during this eleventh annual 30 Days Muslim Prayer Focus. See http://everypeople.net/ramadan/ for more information. Most of the material on this page is drawn from 30-Days with the encouragement of Ron Kernahan of http://www.30-days.net. Please let us know of other appropriate links.